1. "The main thing is to keep the main thing the main thing." 2. "Live out of your imagination, not your history." 3. "We are the creative force of our life, and through our own decisions rather than our conditions, if we carefully learn to do certain things, we can accomplish those goals." 4. "A cardinal principle of Total Quality escapes too many managers: you cannot continuously improve interdependent systems and processes until you progressively perfect interdependent, interpersonal relationships." 5. "Effective leadership is putting first things first. Effective management is discipline, carrying it out." 6. "Our character is basically a composite of our habits. Because they are consistent, often unconscious patterns, they constantly, daily, express our character." 7. "The key is not to prioritize what's on your schedule, but to schedule your priorities." 8. 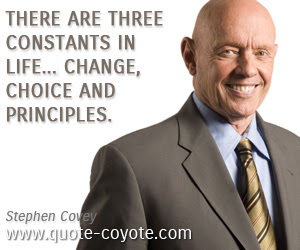 "There are three constants in life... change, choice and principles." 9. "Management is efficiency in climbing the ladder of success; leadership determines whether the ladder is leaning against the right wall." 10. "In the last analysis, what we are communicates far more eloquently than anything we say or do."